Born: Hubert James Marcel Taffin de Givenchy, in Beauvais, 21 February 1927. Education: Studied at the Collége Felix-Fauré, Beauvais and Montalembert; École Nationale Supérieure des Beaux Arts, Paris; Faculty of Law, University of Paris. Career: Worked in Paris for Lucien Lelong, 1945-46; for Piguet, 1946-48; for Jacques Fath, 1948-49; for Schiaparelli, 1949-51; established Maison Givenchy, 1952; president, Société Givenchy Couture and Société des Parfums Givenchy, from 1954; sold company to LVMH, 1988; presented last show and retired, 1995; John Galliano hired as house designer, 1995; replaced by Alexander McQueen, 1996; Hong Kong flagship opened, 1999; opened new Paris showroom, 2000; Julien Macdonald signed as artistic director, 2001; fragrances include De, 1957; L'Interdit, 1957; Givenchy III, 1970; L'Eau de Givenchy, 1980; Vetyver ; Ysatis, 1984; Xeryus, 1986; Amarige, 1991; Fleur d'Interdit, 1994; Organza, 1996; Amarige Extravagance, 1998; Hot Couture, 2000. Exhibitions: Givenchy: 30 Years, Fashion Institute of Technology, New York, 1982; Givenchy: 40 Years of Creation, Palais Galliera, Paris, 1991. Address: 3 avenue George V, 75008 Paris, France. Website: www.givenchy.com . Hubert de Givenchy, fall/winter 2000-01 haute couture collection: spangled decollete dress designed by Alexander McQueen. Fashion Institute of Technology, Givenchy: 30 Years [exhibition catalogue], New York, 1982. Givenchy: 40 Years of Creation [exhibition catalogue], with texts by Catherine Join-Dieterle, Susan Train and Marie-Jose Lepicard, Paris, 1991. Martin, Richard, and Harold Koda, Bloom, New York, 1995. Mainiece, Violeta, Apropos Givenchy, Paris, 1998. Mohry, Françoise, The Givenchy Style, Paris, 1998. "Givenchy: 30 ans de couture," in Textile Suisses (Lausanne), April 1982. "Givenchy Bucol," in Vogue (Paris), February 1985. Arroyuelo, Javier, "La haute couture: Givenchy," in Vogue (Paris), March 1985. "Le point sur les collections: Givenchy," in L'Officiel (Paris), September 1986. Menkes, Suzy, "Strong Chanel Holds Up Couture's Falling Walls," in the International Herald Tribune (Paris), 21 March 1995. Denbigh, Dorie, "The Muse and the Master (Audrey Hepburn and Fashion Designer Hubert de Givenchy)," in Time, 17 April 1995. "Moving Day in Paris: It Was an Emotional Farewell to Givenchy…," in WWD, 12 July 1995. Laushway, Esther, "Givenchy to Galliano," in Europe, October 1995. Min, Janet, "A Cut Above," in People, 15 January 1996. "Givenchy: The Lady and the Tramp," in WWD, 13 March 1997. Singer, Natasha, "Comrade McQueen Takes Moscow," in WWD, 10December 1997. Daswani, Khavita, "Givenchy Continues to Conquer Asia," in DNR, 24 November 1999. Weisman, Katherine, "Shaking Things Up at Givenchy," in WWD, 10January 2000. Naughton, Julie, "Givenchy: The Fashion of Fragrance," in WWD, 22September 2000. Givhan, Robin, "Givenchy's Loss, Gucci's Gain; Designer Alexander McQueen Leaves LVMH," in the Washington Post, 5 December 2000. Socha, Miles, "Givenchy Cancels Big Show," in WWD, 19 January 2001. Menkes, Suzy, "Welsh Wizard Julien Macdonald Takes Over at Givenchy," in the International Hearld Tribune, 15 March 2001. Socha, Miles, "Julien de Givenchy," in WWD, 16 March 2001. "Grace Note, Club Gear and Futurism—Alexander McQueen Said a Graceful Farewell to Givenchy," in WWD, 19 March 2001. Socha, Miles, "Givenchy's Clean Slate: Restoring the Elegance to a Venerable House," in WWD, 5 July 2001. Frankel, Susannah, "In the Shadow of Greatness," in the Indepedent, 15 August 2001. In 1992 Hubert de Givenchy celebrated his 40th anniversary as a couturier. Givenchy chose his vocation at the age of ten, and as a youngster admired the designs of Elsa Schiaparelli and Madame Grés. Later, after stints with Jacques Fath, Robert Piguet, and Lucien Lelong, he spent four years working for Schiaparelli, during which he designed the clothes sold in her boutique, many of them separates, an American idea new to Paris in the early 1950s, for which Givenchy gained a following. Although he is now appropriately acclaimed as a classicist and traditionalist, it was as an enfant terrible of sorts that Givenchy burst upon the couture scene in 1952, just weeks before his 25th birthday. He had a novel collection based on separates, in which even eveningwear was conceptualized as a series of interchangeable pieces. Also noteworthy in this first collection was his generous use of white cotton shirting, which had an economic as well as an aesthetic rationale: the shirting was as inexpensive as it was fresh-looking. The Bettina blouse Givenchy used in later years as his signature was part of this cotton group, and it has reappeared on and off in more simplified and refined incarnations. 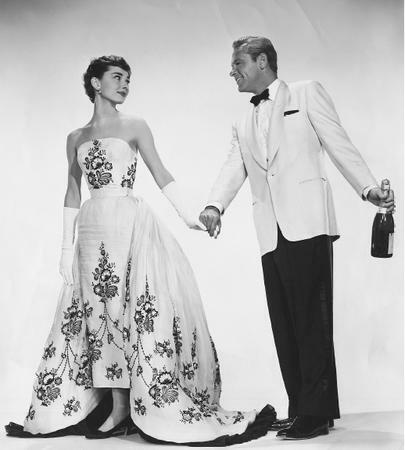 Audrey Hepburn, with William Holden, in a publicity still from the film Sabrina (1954) wearing a gown designed by Hubert de Givenchy. 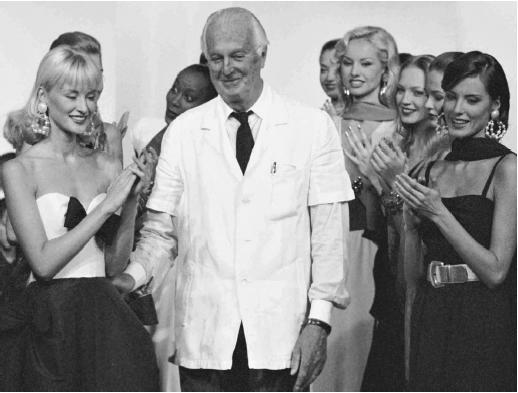 Hubert de Givenchy being applauded by his models at the last show before his retirement, the spring/summer 1996 ready-to-wear collection. very soigné black tailleur and hat in which Sabrina returned from Paris, and the strapless white organdie gown embroidered with black and white flowers (which was the envy of every young woman who saw the film), were both from Givenchy's collection. Givenchy's designs were the clothes that transformed Hepburn from charming gamine to paragon of chic sophistication. Similar transformations were at the heart of Love in the Afternoon (1957), Funny Face (1957), and Breakfast at Tiffany's (1961). By 1963, when Charade appeared, the gamine had finally grown into the sophisticate, and "the world's youngest couturier" had become the most elegant of classical couturiers. Hepburn remained Givenchy's muse for almost 40 years, the quintessential Givenchy client, even flying into Paris from Switzerland to sit in the front row for his collections until shortly before her death. Givenchy shared the ideal of creating a perfect, simple dress from a single line with his idol, Balenciaga. When the two men finally met by accident in 1953, they developed a relationship that was perhaps unique in the annals of couture, with Balenciaga giving Givenchy unprecedented access not only to his sketches, but also to his fittings and his workrooms. Starting in 1959, after Givenchy moved to Avenue George V, almost across the street from Balenciaga, they conferred daily, critiquing each other's sketches and collections. Their aesthetic affinity was such that when Balenciaga closed his couture salon, he referred his most valued clients to Givenchy. Because of the emphasis on line rather than decoration, Givenchy's designs were easy to adapt, endearing him to the many American manufacturers who interpreted them. Givenchy himself helped to make his clothes accessible to a much wider market in the early prelicensing years, designing junior sportswear to be made by American manufacturers with American fabrics, for Seventeen and Glamour magazines. The caption for Glamour 's December 1955 cover, featuring a Givenchy sweater, spoke directly to the appeal of his designs: "The Givenchy marks young chic…meant for long, lean people in pipestem skirts…for when they want to look casual in a worldly way." In the 1990s Givenchy continued designing fashions that make a woman look beautiful; his œuvre bespeaks restraint and refinement, with gradual transitions from one season and style to the next. Although Givenchy still produced cotton separates, including some with Matisse-inspired patterns in his 40th anniversary collection, his designs have matured along with his original clientéle. Givenchy's creations begin with the fabric; his forte is choosing or developing Europe's most luxurious yet tasteful fabrics and embroideries in an expansive range of colors. From these he creates exquisite couture clothes complementing the lifestyles of a clientéle which has included several of the world's most elegant women. He is known for deceptively simple day dresses, superbly tailored suits, coats that are marvels of line and volume, sumptuous cocktail dresses or suits, extravagant evening dresses that are nevertheless eminently wearable, and hats revealing his sense of whimsy and fantasy. Givenchy showed his last couture collection in July 1995, amid a crowd of fashion's most respected and well-known designers, all present to pay homage to the departing master. Nudged out of his own empire by LVMH, who brought in wild-child John Galliano, Givenchy was not bowed. "You have to know when to stop," he was quoted in People magazine, "that's wisdom." After leaving his design house, Givenchy worked on an exhibit about Balenciaga, and had been commissioned to help restore the magnificent gardens of Versailles. Givenchy by Galliano was not a success, and the British badboy was abruptly replaced by Alexander McQueen. Though McQueen managed to last five years, until late 2000, he was unhappy and his designs often did not fit Givenchy any better than Galliano's had. McQueen's last hurrah with Givenchy, however, was a brilliant success. Women's Wear Daily (19 March 2001) commented, "McQueen passed on his final chance to throw a fashion tantrum chez Givenchy. Instead, he showed beautiful, elegant clothes… McQueen's work is ultimately about tailoring, and he showed one great look after another…." Welshman Julien Macdonald was the next to come through Givenchy's revolving door, hired in 2001 as McQueen took up with LVMH rival Gucci, who had invested in McQueen's independent design label. Macdonald, a professed admirer of Givenchy, poured over archival designs as inspiration for his first showing in July 2001. Macdonald described his collection to Women's Wear Daily (5 July 2001) as "Victorian dressing interpreted through the eyes of Helmut Newton." More importantly perhaps for the venerable house was Macdonald's stance as pupil, "I'm listening to everybody… people have been here for 20 years. I can listen to them and I can learn. Givenchy has huge potential; if it's handled right, it could be one of the biggest fashion brands."